Would You Buy a Crowd Funded NBL Type 2 Diesel-Electric Locomotive in N Gauge? Although this is well outside my era and area. One question has come to me. Were any of them preserved? Two fold reasoning if one has been that helps with R&D the second is that it could allow a bit of rule one running for people model the likes of modern image. Class 21 D6142. The Inverurie Works, behind the locomotive have been recently converted into flats/appartments. The building looks exactly the same though, happily. 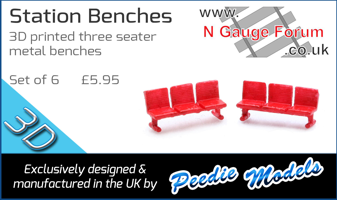 Hi Paul, I think this would have it's best chance of success if partnered with Dapo,l to give them a cash injection and incentive to bring an N-gauge version to market, perhaps sooner rather than later. They are still non-commital, watching the OOs fortunes. Their 00 verison is imminent I believe, and my understanding now is that they used the original drawings that I was trying to track down, to construct their CAD. If Dapol were not agreeable to that then the project perhaps becomes more difficult, since any new partner would , presuambly, have to start again. I happen to know that Dapol obtained the original North British drawings via Glasgow University library, which holds an enormous archive of Scottish material http://en.wikipedia.org/wiki/Glasgow_University_Library though they had to pay a fee. For a 21/29 the obvious starting point would be the 22 CAD as it's widely agreed that Dapol have nailed the characteristic NB "sad-eyed" look. They could possibly use the same cab glazing tools as they use on the 22. But there'd still be a lot of work in designing whole new body, drive-train and bogie sides; together with creating the headcode boxs for the 29 version. If they've already done that in OO, but decided it's not worth the investment in N, this is exactly where Mike and I see Revolution coming in - through our website we find enough customers and pre-orders to take risk out of the equation, giving Dapol the confidence to proceed. Description: Class 21 and Class 40 diesel electric locomotives at London's King's Cross station, 9 August 1959. "© National Railway Museum and SSPL"
I would pledge to buy a class 21 in green with small yellow warning panels & a class 29 in blue with full yellow ends! Hope you voted as well. I hope Dapol are very careful with the photographic evidence. The supposedly NB derived drawings I have seen are all wrong on the roof, not just 'details' but completely fictional. Just about every existing 21/29 model is also completely wrong. The loco on the right doesn't look like a class 40, If it is then it is going to have awful problems turning corners because it has shrouded buffers and a 40 has the buffers on the bogie. It looks awfully like a class 23 Baby Deltic. Agreed. Looking at one of the Haresnape books, it seems that they both had that ladder on the nose, but the D5900s lacked those two funny wedge-shaped things at the front, between the wheels, so typical of the D200s. The photo is "© National Railway Museum and SSPL"
Maybe they don't realise? Maybe you'd drop them a note?